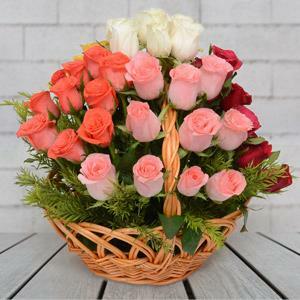 Send Mixed Roses in Round handle Basket to Chennai. Gifts to Chennai. Send Flowers to Chennai. Description : In this arrangement from Gift2Chennai.com you will find 50 Mixed Roses (Red & Yellow & Pink & Orange & White). It is nicely decorated in a Round handle Basket and the whole appearance looks just amazing. Send it to your dear ones in Chennai to surprise them. Also add other Gifts to Chennai with them too.